Green power will take seven traditional vaka, or canoes, on an epic expedition of re-discovery across 15,000 nautical miles of the Pacific Ocean. Powered solely by the sun and the wind, the double-hulled, 22-meter vaka will leave their Pacific home countries over the next month and sail to Hawaii via French Polynesia in the wake of their ancestors. 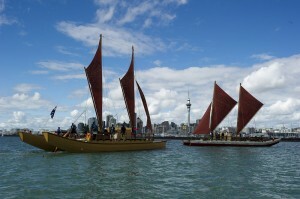 The vaka make up a pan-Pacific network of voyaging societies which aim to raise awareness of environmental issues — including ocean noise pollution, acidification and anoxic waters — in tandem with recapturing traditional Pacific voyaging and navigational skills and re-establishing cultural links between Pacific neighbours. The network is supported by Okeanos, a German-based philanthropic organization which promotes the protection of the world’s oceans and marine life. Four of the vaka took part in a shorter voyage in 2010, sailing from New Zealand to FrenchPolynesia, Cook Islands, Samoa, Tonga and Fiji. Among those on last year’s journey was vaka expert and curriculum manager at the New Zealand tertiary institute Te Wananga o Aotearoa, Hoturua Barclay-Kerr. Mr Barclay-Kerr, who will celestially navigate the Haunui, describes this year’s event as a full performance after last year’s dress rehearsal. Mr Barclay-Kerr says that not only do the crews need to be good sailors who are able to work together in a confined space for a long period of time; they must also be able to deliver articulate messages about being responsible guardians of their environment. After having arrived in Hawaii, the crew will attend a conference addressing the costs which ocean climate change will have for us all if we don’t change our behaviour. The journey of the vaka will continue to North America to teach young people about the voyage and the environment. They will return via the Cocos Islands, Galapagos, French Polynesia, the Cook Islands, Samoa, Tonga and Fiji, with the ultimate destination of the Solomon Islands for the 11th Pacific Arts Festival in 2012. The New Zealand-based contingent of this extreme voyage will depart from Auckland’s Viaduct harbour on April 12th (weather permitting). These four vaka – Gaualofa (Western Samoa crew). Uto Ni Yalo (Fiji), Haunui (Pan Pacific), Te Mataua a Maui (New Zealand) and Hine Moana (Pan Pacific) – rendezvous with the rest of the fleet, Marumaru Atua (Cook Islands) and Faafaite (Tahiti) at the Tuamotu Islands, French Polynesia, in late April for the first part of the project. Once the fleet is underway the public can follow its progress via the official voyage and project website, which will carry daily blogs from crews, as well as on Twitter and Facebook. The voyage will also be the subject of documentary film produced by Okeanos and itssubsidiary, the New Zealand company Oceanic Nature Film Productions. It is time to really get some serious publicity wind around this wonderful concept – I’ll be following the story (see Blogsite above)! Kindly email me any information that you can share. HALLOW EVERYONE I WISH THAT YOU GUYS HAVE A NICE SAILING AN ALSO WISH TAT YOU ALL ENJOY ALL THE SAILING. I WISH THAT WE SEE EACH OTHER AGAIN NEXT YEAR.I WANT TO SEND MA LUV TO MY MOM AUNOFO ON THE HINEMOANA I LUV U N I CAN’T WAIT TO SEE YOU AGAIN.DONT FORGET TO SEND MA LUV TO ALL DA SAMOAN CREW,FIJIAN,AN ALSO THE TOGAN CREW. Can you confirm that the fleet will be due in Honolulu 24 June and please confirm where they will be arriving as I am flying in from Vancouver to meet my daughter on the Cook Islands vaka. Please provide me with a telephone contact in Hawaii as well. Persuant to Keith Johnsons comment, there is a resurgence of interest on this subject including the soon to be released novel, “Voyages of Malolo”‘, which chronicles the voyages of ancient Polynesian mariners circa 1000 AD. For more information Email me at qsiaz@yahoo.com. Met them in the Galapogus, incredible. The navigator had time for all of us dullards, he explained his system for navigating… it is incredible. >To think at one time only one guy remained with the knowledge… now ther are 15 or so. I tap my gps if it misses a beat! The navigator was called Harry… I have nick named him Harry Plotter to aid my memory. He is a fab fellow….